There are so many great vantage points in the parks and surrounding areas where you can watch both Disney World fireworks shows at the end of the night. Most folks head to the front of the parks. Main Street in the Magic Kingdom and the World Pavilion in Epcot, but there are some awesome spots that longtime Disney guests love to head to. Plus, with the addition of another firework show, it is even more exciting! 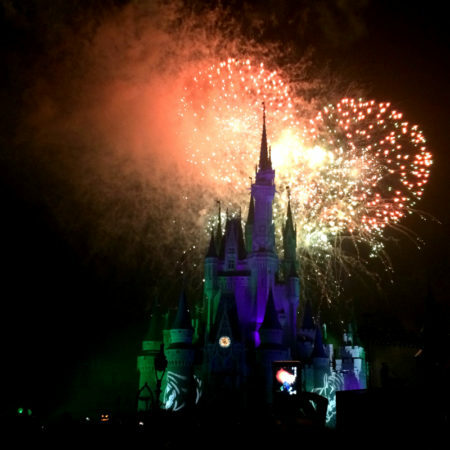 If you are looking for the best places to see both of the big fireworks shows at Disney, be sure to add these spots to your list. 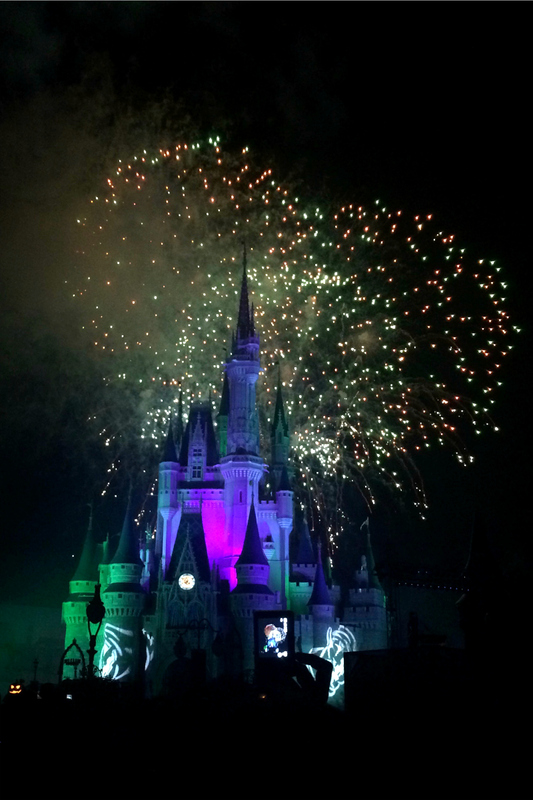 Wishes can be enjoyed both in and out of the park each evening. It is always a tie for which spots are the best, so it really depends on what type of experience you are interested in creating. If you want to be front and center, but don’t want to be standing in a huge crowd, book a spot in the VIP FastPass viewing area where you can sit out on the lawn and catch the entire show as it was meant to be viewed right in front of you. Another suggestion is the train station – head there a little early and you’ll have a great view of the castle and fireworks! Another popular spot is across the water at the Polynesian Resort – either on the beach or in front of one of the large windows in the restaurants. Couples love catching Wishes from the sandy beach in a hammock, where you are usually all alone. In ‘Ohana, you can watch the show while you dine, all the while enjoying one of the best menus in all of Disney World. For another great dining option, the California Grill is always a favorite with longtime Disney guests. There is a dedicated Observation Deck where diners are allowed to watch the firework show. Even though you are not actually in the park, it can feel like you are from this high vantage point. Plus, they broadcast the music and storyline live for viewers. Lastly, don’t forget Grand Floridian! Like the Polynesian Resort, guests can enjoy the show on their beaches/docks or at their waterfront restaurant Narcoossee’s. If you don’t want to book an entire dinner experience, try just dessert! Be sure to check the firework display time for the evening your looking for and plan your reservation about 30 minutes beforehand. Music is played on the deck, where diners can pause from their meals to enjoy the show! Do you have a favorite spot to see both Disney World fireworks shows? Share it in our Facebook Group! The great thing about Illuminations is that you can set up almost anywhere around the World Pavilion and be able to see the show. This means that often there is not crowding or tons of people all around you, making privacy much more possible than what Wishes can offer. The United Kingdom Bridge sits over the lagoon and has little to no obstructions. This clear view lets you see the lower fireworks that sometimes get blocked by the trees and shrubbery that can be found in certain areas of the Pavilion. The boat dock in Mexico is another obstruction free viewing area because it gets you right out on the water. Every night a few people are allowed to watch on the dock, while the general public is allowed on the entrance to the dock. Also in Mexico, you can find areas down along the waterline with no large buildings blocking the best parts of the show. Plus, the fire lanterns nearby make for a toasty experience! Hollywood Studios has been updating its firework programs pretty frequently. No matter the show, there are some great spots of viewing! The paths and benches around Echo Lake are always private and often devoid of huge crowds, making this a nice place to head to when the show starts. Also, if you are in Epcot near the Morocco Pavillon, you can sometimes see the Hollywood Studios firework show! Join our Facebook Group where you can connect with other Disney addicts, ask questions, share photos, and get help planning trip!